To succeed in business today as private label food suppliers, it is not enough to just have great products. You need the support of a great team behind you and you need to be socially responsible. Here at Grand Prairie Foods, we work toward those goals every day in our Sioux Falls, SD manufacturing facilities. Grand Prairie Foods supports a diverse workforce. Since starting our company 14 years ago, we have embraced diversity. A vast majority of our employees are immigrants who have come to this country in search of a better life. They have come to America from conflicted areas such as Sudan, El Salvador, Russia and Guatemala to name a few. We work closely with Lutheran Social Services and participate in their immigrant and refugee programs and are the proud recipient of their 2016 Employer of the Year Award. Grand Prairie Foods has built a dependable workforce and has contributed to lowering Sioux Fall’s unemployment rate to under 2.5 percent. Grand Prairie Foods has expanded its food offerings to meet the demands of consumers who want more nutritious food from their manufacturer. Our Start Healthy brand features products that are lower in sodium and fat but are higher in fiber and protein. The ability to eat healthier foods should not be limited to only a few products. Healthier foods should also taste great and contain healthy ingredients like egg whites, turkey protein, and all natural ingredients. Gluten-free products are also available among our wide variety of food service offerings. Food safety is the foundation of Grand Prairie Foods. We ensure that every product we make meets not only our high-quality standards but adheres to the food safety policies put in place by the U.S. Department of Agriculture (USDA). We are a USDA-inspected plant and perform most of our work in-house instead of subcontracting it out, including packaging, boxing and shipping our products. 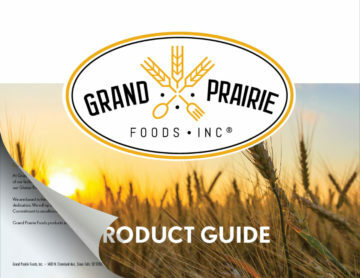 Grand Prairie Foods has a very diversified supply chain to source our high-quality ingredients. This worked to our benefit when the food industry was hit by the avian flu crisis in 2015. We were able to source our eggs, which account for almost 50 percent of our food products from farms that were not affected by this crisis. We have achieved our dream growing from our humble beginnings of only 15 employees to our current workforce of nearly 200 employees. As we take advantage of opportunities to expand our business as private label food suppliers, we look forward to expanding our product offerings and our workforce along the way. We are thankful for our continued growth and are constantly in pursuit of new and improved products to supply to our customers. Our goal is to continue to provide products that our customers want and at competitive prices.